And happy New Year to you too. This year I want to spend some time talking about people who have made a difference. Probably I’ll have some negatives, but mostly positives. And also some comments about news events as they occur. But especially today I want to think about the idea of heroes. The other day I saw an ad claiming that: “everyone can be a hero.” What a load of bullhockey. You know they have something to sell. Everybody can not be a hero; everybody doesn’t even want to be a hero. It’s true that many of the real heroes get little or no recognition, and that’s discouraging for people who work and work, and really contribute enormously of their time and effort, and either they’re out of sync with the times, or they are not understood, or for any number of reasons they simply don’t get recognized. But that doesn’t diminish the contribution. One example I want to talk about later is Dr. Martha Crouch. She was very good at what she did; she recognized the potential problem associated with the technologies being developed by Monsanto, and she tried to warn people and sacrificed her career in the process, because she didn’t want to contribute to the damage that we now know is being done. At that time, hardly anyone was listening. That doesn’t diminish what she did. She’s one of my heroes. 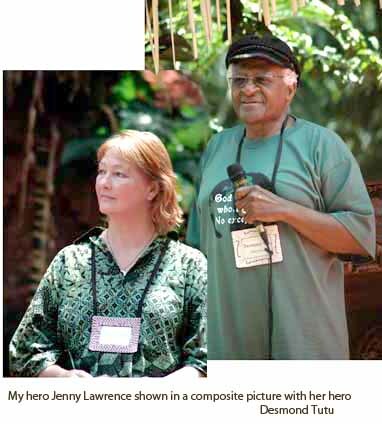 Another example is Jennie Lawrence, who wrote and read the poem you are about to hear. I don’t have time to tell you the whole story of her experience that I admire so much, but I’m using her poem as my dedication to the new year. Who speaks for the dream? Who speaks for the yellow-woods, the wild flowers? Not I said I, numbed into silence by my fear of the human race. Who speaks for the elephants, the tortoise and the butterfly? Not I, said I, stunned into apathy by my fear of the human race. Who speaks for the dolphins, the pansy-shell, the coral reef? Blinded to the truth by my fear of the human race. I hear the clarion call of the whales in the bay. Greetings, say I from the shoreline. Shadowed only by the spector of looming danger. Each day is an unwritten script. And draw closer to the eye of the storm. I speak for the yellow-woods, for the rain forest. I speak with our people; we create community. And this shall be again our garden. I have been studying Buddhism because it seems obvious that we humans have a humongous technology problem that is destroying our home on this earth and has two foundations: 1. We don’t want to learn about and live within the scientifically provable (that means measurable, factual) limits to our human power; and 2. We don’t want to learn about and live within our own best human values. I believe the straightest road from where we are to a resolution of our plethora of biological and social problems is not compassion and it is not science, but it will require that we learn how to combine these two great wisdom traditions. And of course the greatest of these is applied compassion. 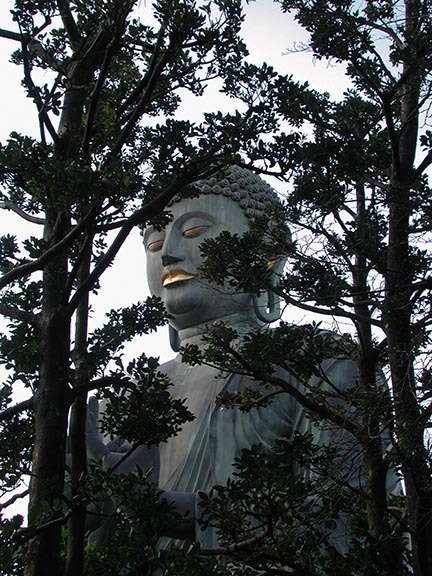 I know more about science than I do about compassion, and so I have been studying Buddhism, because there is no doubt that Buddhism is our best studied condensation of human wisdom over the longest period of human time. I deeply respect the tools that Buddhism provides for the development of positive human values. The foundations of the wisdom are obviously true as they say (over and over and over, for example, everyone dies, everything changes over time – I believe that — you don’t have to prove it to me). Trying to prove something that is obvious by using a proof that is not provable seems to me counter-productive. Maybe some of the mystery of these stories has arisen over the centuries of Buddhist time from a human desire to be more important than other people. In our current age, I think we are not so impressed with how important someone is, and are more interested in finding straight answers to our questions in a time and place where there is no common cultural history to help us. I understand that Buddhist ideas need to be considered and reconsidered, over and over. Not only understood, but incorporated into our consciousness deeper than the merely intellectual level. That is part of the effectiveness of the discipline. But I think we need metaphors that are not so unbelievable if we want to transmit the deep values of Buddhism to westerners. What a shame it would be if the tools of compassion were abandoned or misused in the same way that our sciences are being misused — just at this time when they are so badly needed to inform our scientists and our corporations and our citizens and voters.